Not into takeout? Want healthy meals, but someone to do all prep work? Want tasty meals, but into buying all these spices to use them once? I used to love a local services called Healthy Habits Kitchen, but they closed in 2015. So I wanted to find a Meal Prep Subscription Box Service. 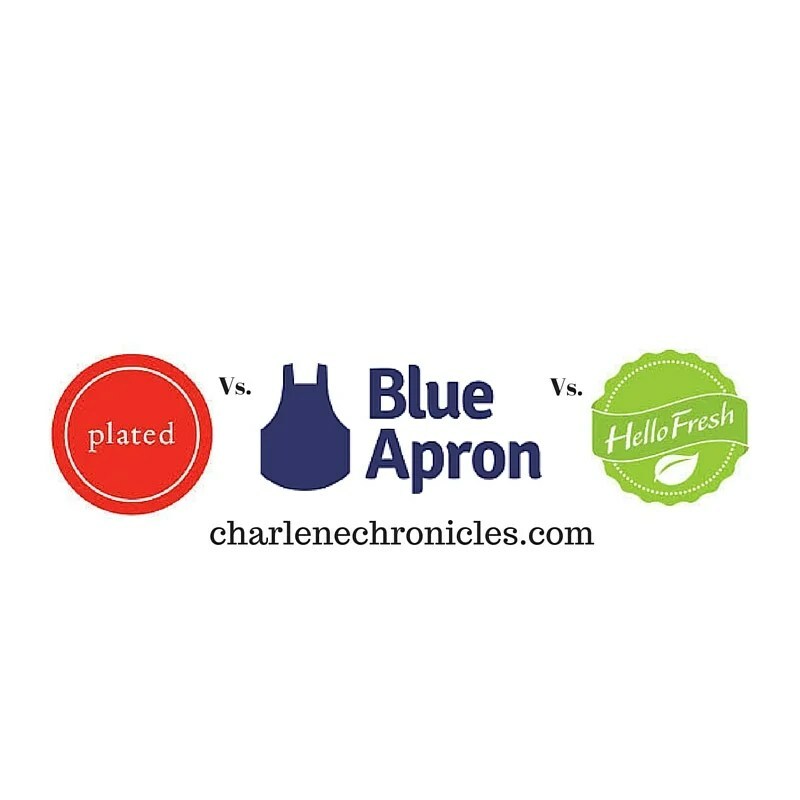 There are three popular healthy meal delivery services I’ve seen in advertisements recently: Blue Apron vs. Plated vs. Hello Fresh. Which is the best though? I tried Hello Fresh about two years ago when it first started, thanks to a complimentary review, and I loved it. The meals were tasty, different, but family friendly. I didn’t have to chop or measure. Everything was done, and all I had to do was cook it. I could embellish if I wanted to. Sometimes I added more pasta or more veggies, but it was optional. Everything was done and on the table within 30-4o minutes – and as a Mom, who has to entertain the kiddos while cooking, that fast turn around time was key. However, take out meals from Whole Foods were less expensive (without the work of cooking) so our family decided to utilize that option. However, fast forward until now, and I miss the flexibility of cooking. Plus, the Whole Foods prices have gone up and the selection is not varied. So, our family is looking for something new in 2016. 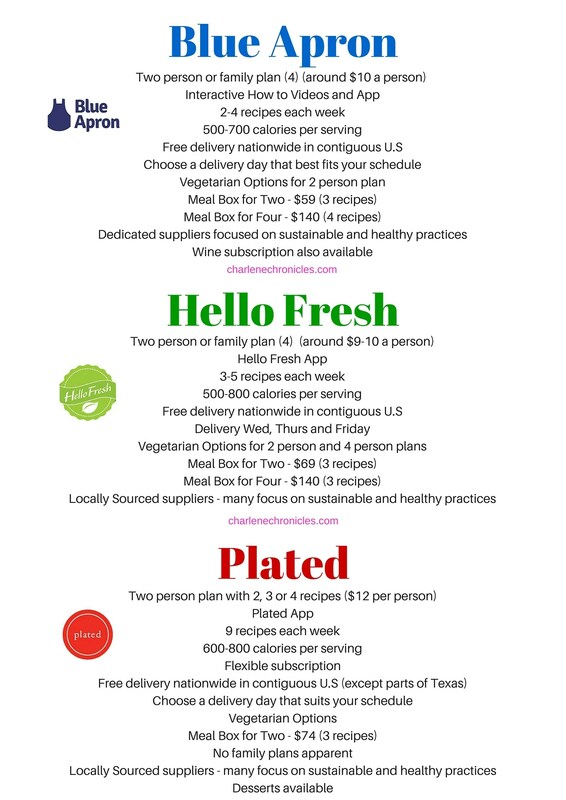 I have yet to try Blue Apron or Plated, but the healthy meal delivery concepts seem the same as Hello Fresh. However, I wanted to compare them and did some research on these popular meal prep subscription box services. The commonality among all of them is that they can’t promise allergy-free meals, and most offer free shipping – with the exception of Plated which charges for shipping for the 2 meal service. They all aim to have healthy food with great food sources. Some of the sites are easy to get information, but I found the Plated site not to have as much user-friendliness as the others. All sites have very few ingredients you need to have in advance and they all come with pre-portioned parts for the meal. The only thing I am not sure of, is the users requirement for chopping or slicing and dicing. If anyone knows, chime in the comments below! Otherwise, the meal subscriptions are very close between the three, but there are subtle differences I should point out. Blue Apron has a wine delivery services and Plated also as a dessert service. Hello Fresh seems to have the most box services available, but Blue Apron generally is the least expensive than the three. I suppose it makes sense to try them all so you can get a sense of the style of dishes that appeals to your family. You can see a sample of the weekly menu on the respective sites if you want a glimpse first. Have you tried one of the healthy meal delivery service companies yet?